Paige Lorraine Tinker, beloved infant daughter of Michael and Danielle Tinker peacefully returned home to her Heavenly Father’s arms surrounded by her loving parents and big brothers on Thursday, January 24th, 2019. 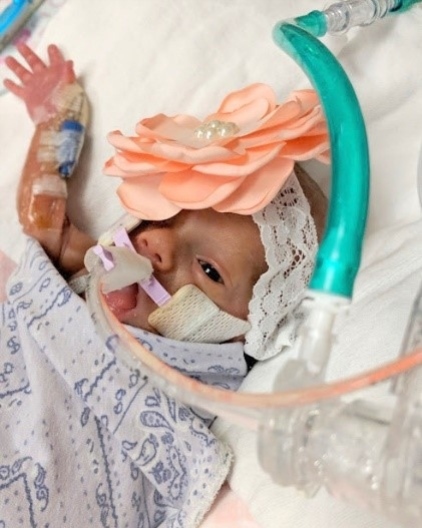 Paige was born four months early on Thursday, December 20, 2018, at St. Luke’s Hospital in Boise, Idaho, weighing just 14 ounces. We knew from the second she took her first breath and let out her tiny little cry that she was here to fight, and that’s exactly what she did! She fought so valiantly for the next 35 days and inspired many people along the way. She showed tremendous strength, courage and determination through health challenges that most will never have to experience in their lifetime. She brought people together, strengthened relationships and taught us the importance of Eternal families. She also taught us the importance of appreciating every single day we have on this earth and to celebrate even the smallest joys and victories with everything that we have. Paige had so much personality for such a little girl. She was sweet, sassy and perfect in every way. She is truly an angel who was just too pure and too lovely to live on this earth, and we feel beyond blessed to have been in her presence. Paige is survived by her parents Michael and Danielle; her older brothers Jace and Brooks; her Paternal Grandparents Brad and Michele Tinker; her Maternal Grandparents Scott and Denice Thornton; her Aunt Michaela and Uncle Brody Chaplin, Uncle Taos Tinker, Aunt Melissa and Uncle Jordan Ray, Uncle Skylar and Aunt Courtney Thornton, Aunt Amy Thornton; and her cousins Broxton, Tinley, Mathis and Soren. She was preceded in death by her Great-Grandfather Al Thornton; Great-Grandmother Lorraine Bolander; Great-Grandfather David Weaver; and her Great-Papa and Great-Mam Larry and Faye Tinker. We would like to thank the NICU staff at St. Luke’s in Boise from the bottom of our hearts for the loving, thoughtful and compassionate care you provided to our precious baby girl. She was loved by every single one of you, and we felt it. For that we will be forever grateful. Thank you for everything you did for Paige and our family. To our little Peanut: We miss you and love you more than you could possibly imagine. Our hearts are completely broken, but we know that you are always with us and that we will see you again - we can’t wait for that day! Thank you for choosing us to be your family. You made our lives better and brought so much joy and happiness to our hearts. We love you so much, sweet angel! Funeral services for our precious Paige with be held on Thursday, January 31, 2019, 11:00 a.m., at the Kuna 15th Ward LDS Chapel, 8625 S. Linder Rd., Meridian, ID 83642. We will greet family and friends prior to the service from 10:00 to 10:50 a.m.
A graveside service will immediately follow at Dry Creek Cemetery in Boise, Idaho. We would like to thank Kam Neth from Little Heros, a nonprofit organization that provides remembrance photography. She so graciously volunteered to photograph precious moments with our baby girl that we will cherish forever. In lieu of flowers, we would be pleased to have you support her mission to help other grieving families through the gift of her photography. Little Heros - 2825 N. 26th St. Boise, ID 83702.